You really love Dino Eggs, don't you? I'll join that club. I love Dino Eggs, its a game I discovered on the C64 that, after figuring it out, became very addictive. 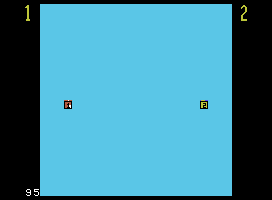 Any homebrewers out there looking for ideas on porting a game to the Coleco, this would be a great one! Dino Eggs for the Colecovision does exist according to first hand knowledge of someone I have known for over 30 years. He went to some computer expon in New York around the 83/84 timeline and at the very least seen a working demo. Is that to say that it was not the full game, he says it was. This thread started January 29 and now going on 3 months around the corner. Edited by Mike Harris, Fri Mar 22, 2019 10:55 AM. If they're planning to sale this game, it's normal to take so much time to release it. Speaking of, I need to get some blank eproms, circuit boards, cartridge cases and an eprom writer. Someone point me to the right direction. I remember seeing all the ads and reviews for it in magazines BITD and waiting for it to be released for the CV... which never happened. Anyway, I can't really say I love it because I never have played the game even thru emulation. ^ I'll join the chorus and state that Dino Eggs is one of the very platform games ever released. I'm shocked that it has never had a homebrew release for CV as well. It would be easy to fit into 32k, and a talented CV programmer could make an outstanding conversion of the game for CV -- there are no technical hurdles and / or insurmountable challenges. The fact that it is mostly static -- no side scrolling or screen scrolling makes it an excellent match. Ditto for CRISIS MOUNTAIN and SHORT CIRCUIT as well, both written by the same author as DINO EGGS. Its April 1st! Can we finally know what was found?? Nothing . It was an april joke! It's not real...... or is it? Edited by retroillucid, Mon Apr 1, 2019 1:30 PM. 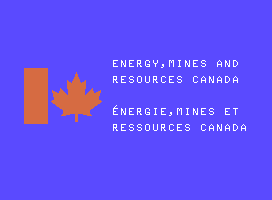 You have to wonder why it was never released when it falls under other great Canadian software classics such as the Pine Syrup Tester 1.3 and The Official Salmon Cleaning Simulator. Edited by Mike Harris, Mon Apr 1, 2019 2:00 PM. 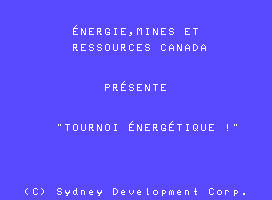 You have to wonder why it was never sold or released when it falls under other such great Canadian software classics releases such as Syrup Tester 2.0 and The Official Salmon Cleaning Simulator. PLEASE tell me that you"ll sell this in a plain white box with insufficient instructions. And make me go to Service Canada and get in a line to buy one! LOVE THIS. Sell me a copy and I can pretend that it's 1983, have my own Teleguide kiosk, and am playing "games" while also looking up the weather in exotic destinations like Manitouwadge and Armstrong. I may even build a CV kiosk and stick in the lobby of the Provincial Building in town (I work in it!) to give visitors a thrill. Dang it! I talked myself out of it back on 2/11/19. 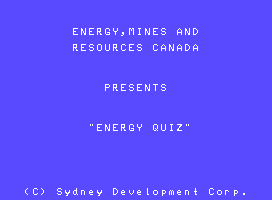 Isn't Energy Quiz the proto that Toby once owned many moons ago? Edited by NIAD, Mon Apr 1, 2019 8:40 PM. Now april 1st is over, when are you going to release the rom and the cartridge? Can you post a photo of the cartridge. mr_me maybe means a picture of the cartridge without the title removed.